When it comes to art, I've realized that I'm obnoxiously picky. In fact, other than photographs and mirrors, we don't have a lot on the walls in our apartment. (We also rent, so we don't want to make too many holes - ha!) I guess I feel like it's such a commitment and I always want to make sure any art we buy will fit seamlessly into our decor. But lately I find myself wanting to add some more personality to our place, and have really been drawn to fun and quirky prints and sayings. I'm especially loving the idea of creating a gallery wall somewhere in our apartment (see inspiration above). There's a bare wall in our living that would be the perfect space for it as well as a smaller space in my closet. Unfortunately for my husband, I tend to prefer the really girly/fashion prints so I don't think that's going to fly in our shared space. The closet, however, is a different story. But we'll get to that later! Below are some of the prints I'm currently loving and would consider using as a starting point for our very own carefully curated collection in the living room. I'd love to mix a few of these in with other photos and sayings that are meaningful to the hubs and I. All photos available on Minted.com! 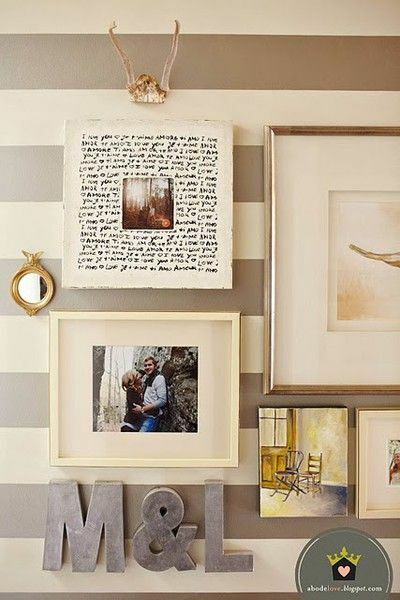 Do you like the idea of a gallery wall? Do you have one? If so, what did you include in yours? The one with the blue couch...that's what I want! I created a gallery wall behind our couch that has these really cool prints on old dictionary pages (http://www.etsy.com/shop/VintageDictionaryArt?ref=seller_info) + some vintage fashion patterns & Vogue magazine covers -- I definitely recommend the gallery wall, it's such a fun way to make the space interesting and dynamic! P.S. Love your blog theme with the gold (obsessed with gold). Gave you some bloglovin'! Lookingn forward to following your work. I love gallery walls, it makes a room stand out - great inspiration! I had one until our bedroom remodel about three weeks ago. It was really simple because I didn't want to commit to anything crazy. Our walls are tan so I bought white frames and white shelves (the small) kind so I could store little things on the shelves and left the frames empty. The wall has sort of evolved now that we moved things around our room and I've added some real art (that I snagged on sale online) and has changed shape, but I love the simple white frames against the tan walls. I highly recommend Hobby Lobby. (I DID have to bring the frames back from one in Michigan, but they do sell them online and I just learned about a Hobby Lobby about an hour from DC). Sorry this is a novel!